Live commentary on Radio 5 live and Radio Ulster, BBC Sport website and BBC Sport app, plus live text commentary. 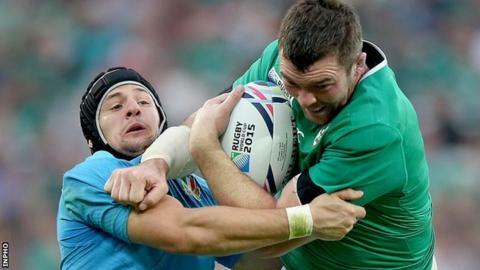 Ireland did not produce the kind of performance they would have wanted, or indeed expected, against Italy but they are in the World Cup quarter-finals now so there is no need for any panic. Italy produced their best performance for some time. The last time I saw them play that well was when they beat Ireland in Rome in the 2013 Six Nations. We probably all underestimated Italy heading into the Olympic Stadium game on Sunday and assumed there was no chance of them getting back to that kind of form. Inspired by Sergio Parisse, they played one of the games of their lives and I think the Ireland players maybe just weren't expecting that after the way the Italians had struggled against France and Canada. How wrong we were and given Italy's great performance, Ireland do deserve some credit for getting the job done - albeit in rather unconvincing fashion. They opted to commit only one man to the early breakdowns and fan out in defence instead of really going at the opposition. That did not set a good tone for the game. You have got to absolutely fire into the first couple of breakdowns and make it really, really difficult for the scrum-half to get the ball away. Overall, Ireland were just too passive in defence and I really felt Jared Payne's absence in midfield was keenly felt with Robbie Henshaw looking a wee bit unsure of himself alongside Keith Earls. Italy were able to make ground fairly easily through the Irish defence during much of the contest and I think it might have been a different story had Jared been in there. And while the stats showed Sean O'Brien as making more carries (10) than anyone else, I don't think the Tullow Tank will have been that impressed with his own performance. I did not really see him win any turnovers at ruck time in the way that David Pocock and Michael Hooper did against England on Saturday night. If anything, the outstanding Iain Henderson, Paul O'Connell and Rory Best were the Ireland players getting over the ball in breakdown situations. Joe Schmidt's work-ons sheet will be long enough this week and there will certainly be no danger of any Ireland complacency heading into the France game. I would say Joe will be emphasising the importance of hanging onto the ball. Maybe some of the criticism of Ireland's off-loading ability - or lack of - got into the players' heads because they attempted a few passes which were 50-50s at best. In games against France, if you give away the ball when attempting a risky pass, five times out of 10 they are going to score a try off it given their counter-attacking ability. In terms of Irish positives, Henderson was absolutely magnificent again while I thought Peter O'Mahony's excellent contribution extended well beyond his vital try-saving tackle to deny Josh Furno early in the second half. Peter made the line-out steal which started the play for Keith Earls's try and he also carried well. For Sunday's Pool D decider, Rob Kearney will obviously return to full-back with Payne hopefully fit to start at centre. If I was picking the team, I might consider playing Luke Fitzgerald at centre alongside Jared but it is more likely than Joe will keep Robbie Henshaw at 12. The battle for the two wing slots will be at full pelt again in training this week with possibly Tommy Bowe and Earls getting the nod. Cian Healy's ability to win some hard yards might lead to him starting in place of Jack McGrath with other changes to the forwards unlikely. When it comes to France, you just never know which team is going to turn up. Freddie Michalak ran the show against Canada but you would hope that the Ireland back row will make his evening a lot more uncomfortable at the Millennium Stadium. With the likes of Louis Picamoles, Mathieu Bastareaud and Thierry Dusautoir in the France side you know it is going to be tough and brutal but I think Ireland will come out on the right side of the result. After all, Ireland have been preparing for this game for six months. I can not finish without some reflections on England's World Cup exit though it has pretty much all been said over the last 48 hours. To be honest, I was amazed by some of the reaction in the England squad immediately after the defeat by Wales the previous week. Inspite of that gut-wrenching loss, they were still very much in the World Cup but you would not have thought that judging by the head-in-hands reaction of some of the England players. Mike Brown's monosyllabic TV interview also did not send out great signals about England's ability to regroup for the Australia game. Fair play to Australia for a tremendous performance and you could see what the victory meant to coach Michael Cheika at the final whistle. Credit to the England players and management, as well, for admitting they simply were not good enough at this World Cup.